Thanks to a 10-year occupation by Yogi Berra, and an ongoing state of paralysis while the team frets over the implications of retiring the jersey forever, only 14 Mets – just 11 of them players including Yogi who barely qualifies – have ever worn the No. 8 jersey. Needless to say, constructing a Top 10 list is challenging and more pointless than usual. But it’s not as if challenging and pointless are deterrents around here. In fact the following list is even more useful than the others in this series because it can also be read upside-down as a Bottom 10 list. Isn’t that something? Big mustache, big hair. Very short Met career as a would-be backup to Stearns and Hodges in1982. He had three pinch-hitting appearances in April and was then sold to Seattle, where he happened to have grown up. By mid-season, his No. 8 jersey was on the back of the next man on this list. Mainly remembered as one of the guys we received in the blessed Richie Hebner trade, Mankowski wore 8 only during his 1982 appearance when he subbed at third base for a couple of weeks in place of an injured Hubie Brooks. I definitely have a stronger association with Mankowski wearing No. 2 in 1980 even though looking up the stats reminds me he played very little that year too. Anyhow, by September of 1982, the No. 8 jersey had passed from Sweet to Mankowski to the next man on this list. Like Sweet, a backup catcher; and like Mankowski, a guy for whom I have two uni-number associations, Reynolds was the third and final wearer of the No. 8 jersey in 1982, thanks to a September recall from Class AA Jackson. Considered a tough, defense-first type of backstop, Reynolds broke camp with the big club in 1983 as Ron Hodges’ primary backup while John Stearnswas out with an injury. He’d go back to the minors once Stearns fully recovered. Reynolds however wouldn’t return until 1985 – and by then wearing a different uniform, No. 9. The new uni number was because the Mets in the interim had acquired the first man on this list. The lengthy gap between appearances was because of the next man on this list. Gibbons was the third of the Mets’ three first-round selections in the 1980 amateur draft, and the 24th pick overall. The Mets famously selected Darryl Strawberry with the first overall pick and later got Billy Beane picking 23rd (the additional selections affording the Mets Beane and Gibbons were compensation for having lost free agents Andy Hassler and Skip Lockwood, respectively). It was a fateful haul, with Strawberry destined to become the team’s all-time slugger and Beane a revolutionary team executive. Gibbons would later become a hot managerial prospect with the Mets organization leading to a five-year gig as the Blue Jays manager which ended last summer. Most recently he was named bench coach for the KC Royals. But injuries would eventually arrest Gibbons’s progress: A broken jaw in 1984 cost him his first opportunity and he wouldn’t get a second – other than a brief backup role wearing No. 35 in1986. Also in the official records is a September appearance in 1985 when he was issued No. 43but did not appear in a game. Here’s another strange thing about Met No. 8s. Of the 11 players on this list who wore No. 8, seven of them also spent time in a Met uniform with a different number on the back. You might remember Dan Norman as a No. 33, which was his number in his first few appearances with the Mets in 1977 and 1978. He eventually got No. 8 when he came up for a lengthier stay beginning in 1979. Norman is probably best remembered for being the fourth and final piece of the Tom Seaver haul – the only player in that fateful 1977 trade who didn’t immediately join the Mets, and to certain heartbroken 11-year-olds, he held a certain mysterious promise. 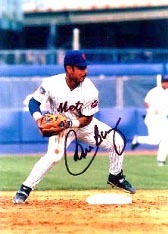 Norman was a powerfully built outfielder with good numbers in the minors but limited success with the Mets. After a brief trial as an everyday outfielder in ’79, they turned him into a full-time reserve in 1980 and later included him with Jeff Reardon in a deal for another ultimately disappointing right fielder, Ellis Valentine. In order to fit 11 players into 10 slots I needed a tie somewhere so I chose this pair of veteran journeymen, each known for their professionalism and positive attitude. Dave Gallagher of Trenton, N.J. is among the few Mets of the “Worst Team Money Can Buy” Era not to be remembered poorly. Acquired from the Angels for Hubie Brooks prior to the 1992season, Gallagher had a reputation as a good defensive outfielder and most often was called on late in games to curtail the potential defensive shenanigans the rotation of starters (Bonilla, Johnson, Coleman, etc.) represented. Desi Relaford was just the kind of bench player a team likes to have: Though he’d failed as a starter and came only at the cost of waiver claim, he was still young (27) and possessed both young player’s skills (speed and the ability to play the middle infield) and the demeanor to re-establish his reputation. His one and only season for the Mets, 2001, would turn out to be the best of his career, and the Mets alertly parlayed into a trade for two players who would help – theoretically, at least – in 2002. On May 17, 2001, with the Mets getting hammered by San Diego, Relaford entered as a pitcher in the 9th inning and retired the Padres in order on 12 pitches, including a strikeout. We’re fairly sure that event marked the lowest number ever to pitch in a game for the Mets. The Mets’ first No. 8 in their history was catcher Chris Cannizzaro, selected in the expansion draft from St. Louis. He was an actual prospect but had missed the majority of the 1961 season after an appendectomy and his future behind the plate was blocked by a kid named Tim McCarver. Were he any more desirable in other words, he would be off-limits. “I’m glad they picked Cannizzaro, because I’m happy he is getting a chance to play. He is a fine prospect who never had a chance with us,” said Cardinals general manager Bing Devine. Cannizzaro’s chances with the Mets were difficult to come by too, though by 1964 he’d demonstrate a certain usefulness with a .311 batting average in part-time duty. Cannizzaro would later play for the expansion San Diego Padres and become the first All-Star in that franchise’s history. Met GM Joe McIlvaine by the 1990s for the most part had become a value speculator: His portfolio was full of good stocks purchased at low prices – Gilkey, Olerud and Johnson types – that sometimes paid off big. Then there was Carlos Baerga, whose value was not only down but whose price would be a lot higher than Joe Mac ever imagined. And that value was down to stay. Although Baerga arrived amid whispers he was more attached to his cellphone than to his teammates, his attitude in New York looked pretty good. It was his slowing bat and expanding waistline that were the trouble. And while it may be unfair to hold Jeff Kent’s future success against Baerga the least he coulda done was outplayed Jose Vizcaino. Baerga began his Met career in 2006 wearing No. 6 – coach Steve Swisher had the No. 8 jersey then. He moved into 8 at the beginning of 1997 and wore it until his contract expired after 1998. Among Gil Hodges’s lasting legacies was a competent coaching staff, the core of which was still doing business together a decade after he passed away. There was pitching coach Rube Walker – who was a former catcher. Joe Pignatano, also a former catcher, tending the tomatoes in the Shea bullpen. And Eddie “The Walking Man” Yost on the coaching lines at third, a superstar of on-base percentage long before anyone really cared much for the stat. One thing that long-lived coaching staff wasn’t comprised of was future managers, which put the Mets in a bind when Hodges suddenly passed away shortly before the season was to begin in 1972. Bob Scheffing, who himself was thrust to the general manager’s role following a sudden death in the front office, was a former manager but not a particularly accomplished one. He expressed lukewarm interest in nominating himself for the role. The next internal candidate was former Yankee legend Yogi Berra, who’d been fired following his single season managing the Yankees in 1964 and been in the Mets’ employ as a catcher –a few turns at-bat only – and a coach ever since. As one writer remarked Berra could probably have stayed a Met coach forever – he was that well-liked by players and the media. But subject to the greater scrutiny that comes with the Skipper’s hat, he wouldn’t last forever. Berra in fact survived a lengthy referendum on his job in 1973 and by the end of that year he and the Mets had improbably staved off elimination. But he was fired in 1975 amid the general feeling that the Mets underachieved given their level of talent during his reign. A year ago, while schilling copies of the Mets by the Numbers book at a New Jersey book store, I had a chance for a brief meeting with Gary Carter – on hand to schill his own book. During a brief break in his furious signing activities I presented him with an autographed copy bookmarked at Chapter 8. “Thanks!” he replied with a big smile and firm handshake, as an assistant put the book aside. “I’ll be sure to read it!” and resumed signing. 1) That was a really nice thing to say. 2) Could he have possibly meant it? And I knew right then: I’d definitely met Gary Carter. I’m on record here as favoring a less-is-more attitude when it comes to number retirement and the ongoing limbo of No. 8 since Carter’s enshrinement in the Hall of Fame is a good example of why. If you’re going to be wavering on it for years, and if you’re terrified that in his next interview the guy’s going to say something that will embarrass the organization, then he probably isn’t a guy whose number deserves retiring anyway. This is to take nothing away from Carter’s achievements on the field which were sublime and often heroic and make him, by a long shot, the greatest man ever to wear No. 8 for the Mets, much less anyone else. And Carter to his credit was a bit of a freak about it. His one non-negotiable demand upon joining the team was that he be offered No. 8 (sorry Gibbons), a number reflecting both his birthday (April 8) and wedding day (Feb. 8). Submitted by Ranjrz5 on Wed, 03/18/2009 – 9:26am. Dan Norman’s best-known moment was probably the collision that marred Lee Mazzilli’s poster-boy looks for a while. Submitted by Jon Springer on Wed, 03/18/2009 – 11:25am. Wheels are turning… top 10 Collisions…. Submitted by G-Fafif (not verified) on Wed, 03/18/2009 – 3:30pm. Terry Blocker and Danny Heep in a nasty one, 6/9/85 (second game of doubleheader vs. Cardinals, resulting in ITPHR for…Terry Pendleton). Submitted by Ranjrz5 on Wed, 03/18/2009 – 9:39pm. I remember Dykstra-Wilson… Lupica called it Outfield Slam Dancing. Couple of other memorable things about the 8’s for me. Submitted by Adam (not verified) on Thu, 03/19/2009 – 11:08pm. Couple of memorable things for the less memorable 8’s. The Mets were not the only NY team Phil Mankowski played for he was also a NY Knight having appeared as an extra in “The Natural”. Ronn Reynolds was the catcher who caught the secret bullpen sessions for Sidd Finch, wear he left with bruised hands while catching Siddhartha’s 140 mph fastballs in the SI articles. John Gibbons was part of one of the most memorable game ending extra inning plays in Mets history. Getting flipped over blocking the plate in SD in the 11th inning after receiving a throw fromDykstea getting up and throwing out the runner at 3B for a routing 8-2-5 double play to preserve a Mets win. I remember Dan Norman as the only guy in the 70’s to wear his socks over his knees while everyone else was putting elastic in their stirrups so that they mainl showed their whit sani socks. A trend setter 30 years ahead of his time. Submitted by Jon Springer on Sat, 03/21/2009 – 8:24am. I recall the Gibbo double play– awesome. One more interesting thing. Ronn Reynolds: His first name was Ronn, with two N’s like that. Not Ronald or Ronnald. Submitted by SteveJRogers (not verified) on Sat, 03/21/2009 – 6:37pm. -A whole darn bunch of #8s were generally catchers. 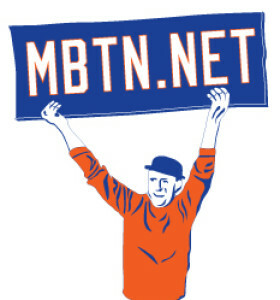 -Phil Mankowski apparantly was sports talk show host Sid Rosenberg’s favorite Met. -It is strange that #17 seems to garner more retirement support than #8 from the Met faithful, yet #8 isn’t wasn’t handed around like a hot potato, and has been out of circulation for some time now.